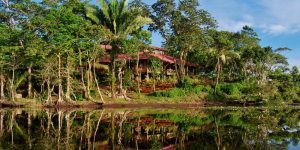 Rio Indio Lodge, near San Juan de Sur, Nicaragua, is set amid giant tropical hardwood trees for maximum comfort. The lodge property and the huge surrounding reserve are home to Jaguars, Tapirs, Ocelots, three species of monkeys, Dart Frogs and much more. Fish nearshore and in the rivers, canals and lagoons for Tarpon, Snook, Guapote (Rainbow Bass), Machaca and other exotic species on 22ft open Sportfisherman and/or 16ft Jon boats. The main dining room, lounge bar and reception area are done in solid oak. Cable TV, satellite telephone and e-mail service are available. Thatched-roof walkways connect the lodge and spacious guest bungalows that offer 27 premium bedrooms, each with two queen beds, bathroom with shower and hot water, balcony overlooking the lagoon with jacuzzi, two ceiling fans and in-room safe. Rio Indio Lodge packages include three San José airport transfers, one night at a San José hotel; round-trip charter flight on a Cessna or Aztec commuter plane; three, four or eight days’ all-inclusive accommodation; fishing on lodge boats, taxes, all meals, coffee, fruit juices and evening rum bar. Beer, soft drinks, other liquors and bottled water. Does not include, Costa Rica exit tax, or Nicaraguan border entrance and exit fees. Non-anglers can also be accommodated.